VSEVOLOD BOBROV (9) scored one goal in the USSR's 4-0 victory over the United States at the 1956 Winter Olympic Games in Cortina d'Ampezzo, Italy. VSEVOLOD BOBROV was the first great goal-scorer in the history of Soviet ice hockey. Bobrov was also, like his contemporary, the Czechoslovak scoring star VLASTIMIL BUBNIK, a two-sport athlete who excelled in soccer, as well. In fact, Bobrov began his athletic career as a soccer player with the army club CSKA Moscow after serving in the Soviet military during World War II. The 22-year-old led the Soviet league with 24 goals for CSKA during the 1945 season and was also invited to join Dynamo Moscow for their famous tour of Great Britain in November of that year. Bobrov scored six goals on the tour as Dynamo played top British clubs including Arsenal, Chelsea and Glasgow Rangers. Bobrov began playing hockey, as well, for CSKA Moscow a year later. In 1950, Bobrov had miraculously escaped death. The plane carrying the VVS MVO Moscow hockey team, the club of the Soviet air force, crashed on approach to the airport at Sverdlovsk in adverse weather and killed everyone on board. Bobrov, who missed the flight, later claimed his alarm clock malfunctioned and, therefore, saved his life. Bobrov actually made his debut at the Olympics with the Soviet national soccer team at the Summer Games of Helsinki in 1952. Now 29, Bobrov scored five goals in three games at Helsinki. Bobrov notched a hat trick in the famous 5-5 draw with Yugoslavia; the Soviets by four goals with just seventeen minutes left before storming back to tie the game. Bobrov was a particularly lethal goal-scorer in ice hockey, however, and totaled an amazing 250 goals in just 130 Soviet league games for his career. Bobrov added another 94 goals in 59 games for the USSR national team. 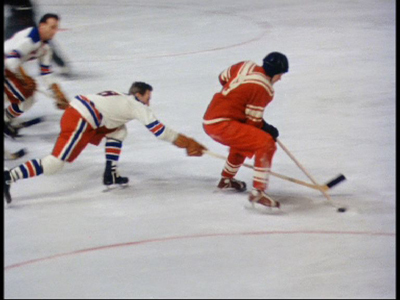 At the 1956 Winter Olympic Games at Cortina d’Ampezzo, Bobrov scored nine goals in seven games as the Soviet Union captured their first-ever gold medal in ice hockey. Bobrov’s goal total tied for the tournament lead with Canada’s GERARD THEBERGE. In the Soviets’ second game in Italian Alps, a 10-3 victory over Switzerland, Bobrov bagged four goals in all. This mark was equaled twenty years later by VLADIMIR SHADRIN at Innsbruck in the qualification game against the host nation. 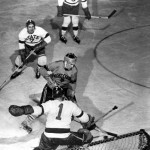 Left : United States goaltender WILLARD IKOLA minding the nets for the University of Michigan. Right : Canada’s 1956 Olympic goaltender DENIS BRODEUR. Following the conclusion of the Second World War, the Canadians pretty much had their way with the United States at major international ice hockey events well into the 1950s. 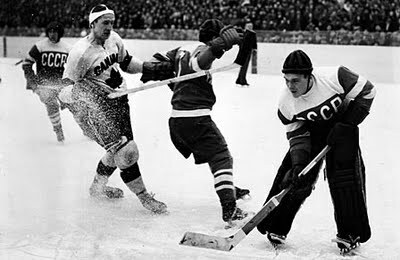 Although the U.S. scrambled a 3-3 draw with Canada at the Oslo Games in 1952, heavy losses such as 12-3 at the St. Moritz Games in 1948 and 16-2 at the 1951 IIHF World Championships in Paris were more indicative of contemporary results for the Americans against their neighbors to the north. A year prior to the 1956 Winter Olympics, the Untied States had been thrashed 12-1 by Canada, represented by the Penticton Vees, at the annual World Championships in West Germany. In the second game of the final round-robin at the Games of Cortina d’Ampezzo, the Canadians a.k.a. Kitchener-Waterloo Dutchmen, as could be expected, had little trouble mounting an assault on the American goal in the Italian Alps. Holding the fort, however, was WILLARD IKOLA, the two-time NCAA champion at the University of Michigan. The 23-year-old natvie of Edina, Minnesota, turned aside 38 shots to stiffle the nation that had won five of six Winter Olympic ice hockey tournaments to this point. The United States, meanwhile, were gifted a goal by Canuck goaltender DENIS BRODEUR and never looked back on the way to a surprising 4-1 win. Perhaps on the strength of this performance, it was Ikola who ultimately was tabbed by the International Ice Hockey Federation Directorate as the Best Goalie of the tournament for the silver medal-winning United States squad. WILLARD IKOLA became a highly successful coach at Edina High School in Minnesota after his playing career. Ikola set the Minnesota state record with 616 wins (against 149 losses with 38 ties) upon retirement in 1991 as Edina HS captured eight state titles under his tutelage. DENIS BRODEUR is the father of current New Jersey Devils goaltender MARTIN BRODEUR, who is scheduled to make his fourth appearance at the Winter Olympics for Canada next month at the Vancouver Games. After seven failed attempts, including the meeting at the 1920 Summer Games in Antwerp, Belgium, the Unites States finally defeated their neighbors to the north, Canada, at the Olympics in 1956 at Cortina d’Ampezzo. 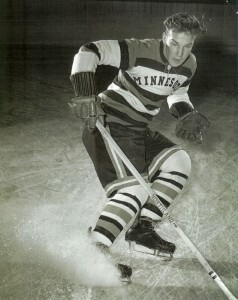 The architect of the United States offense in the historic 4-1 win over Canada was JOHN MAYASICH, who provided the margin of victory with three goals. Mayasich was gifted one goal in the Italian Alps by Canadian goaltender DENIS BRODEUR, who allowed a puck lofted high in the air from the three-time All-America at the University of Minnesota to somehow elude him and land in the net — Mayasich had been seeking a line change. The match was played at night in an outdoor arena; Brodeur lost the puck in the lights. Mayasich finished the top scorer for the silver medalist United States at the Cortina Games with seven goals and 10 points in seven games. Goaltender NIKOLAI PUCHKOV (far right) plays the puck for the Soviet Union at the 1954 IIHF World Championships in Stockholm. With Pushkov between the pipes in Sweden, the USSR captured the annual IIHF title on their debut at a major international event. 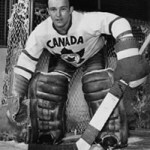 In the much-anticipated return match at Krefeld, the goaltender of the Soviet Union, NIKOLAI PUCHKOV, had been banished to the bench early in the third period as Canada re-captured its typical top spot at the 1955 IIHF World Championships in West Germany. After allowing four goals versus Czechoslovakia in the Soviets’ fifth game, there had to be some concern among the USSR coaching staff with respect to Puchkov’s play heading into the final two rounds of the ice hockey tournament at the 1956 Winter Olympic Games in the Italian Alps. Left on the schedule were the United States and Canada, the two top goal-getting teams outside of the Soviets themselves at Cortina d’Ampezzo. The Americans and the Canadians were also the returning silver and gold medalists, repsectively, from the Oslo Games in 1952. Champion players will rise to the occasion, however, particularly at the Olympics under the scrutiny of an entire planet. In the USSR’s penultimate match, Pushkov produced 24 saves for the Soviets in the 4-0 whitewash of the United States in the first-ever meeting of the world’s two contemporary superpowers. Then, the 25-year-old delievered another flawless performance when the Soviet Union required such most. Pushkov pushed out 23 more shots against Canada — the CSKA Moscow netminder’s work all the more noticeable on account of the fact the USSR, for their part, totaled just nine shots in response. Despite this lack of sustained attack, the Soviets skated off 2-0 winners opposite Canada on the final day at Cortina d’Ampezzo. In all, Puchkov posted three shutouts for the USSR at the 1956 Winter Olympics but, somewhat surprisingly, was not selected as the tournament Best Goalie by the International Ice Hockey Federation Directorate. Order having been restored by the Penticton Vees at the 1955 IIHF World Championships in West Germany, the Kitchener-Waterloo Dutchmen were dutifully dispatched by CANADA to Cortina d’Ampezzo in the Italian Alps to retain the Olympic gold medal at the 1956 Winter Games. The Dutchmen were coached by none other than BOBBY BAUER, a famous member of the ”Kraut Line” which helped the Boston Bruins capture two Stanley Cups prior to the outbreak of the Second World War. The SOVIET UNION, meanwhile, had suffered some genuine humiliation with the 5-0 loss at the hands of the Canadians on the final day of the 1955 tourney. Later, some speculated as to whether or not the Soviet team had been suffering from overconfidence at Krefeld. Whatever the case, the USSR arrived in Italy a motivated and determined squad aware that only one result would satisfy the coaching staff and domestic hockey officials. Canada were well aware of the chief Soviet scoring threat VSEVOLOD BOBROV, who had scored nine goals in six games for the USSR coming into the final day’s play at the 1956 Winter Games. Great attention had been paid to the 33-year-old in West Germany following the Stockholm disaster of 1954; Bobrov did not so much as register a shot-on-goal as the USSR were blanked at Krefeld. A similiar strategy was adopted by Kitchener-Waterloo in the Italian Alps with some effectiveness. Bobrov was knocked to the ice three times in the first period by Canadian checkers and did not appear at all on the ice in the second stanza. The Soviet Union were far from a one-line show, however, and the Canadians’ close marking of the CSKA Moscow star was bound to present opportunities to others in front of the 12,700 outdoor crowd on hand. And so stood up the USSR second line, the Dynamo Moscow trio of Krylov-Uvarov-Kuzin. 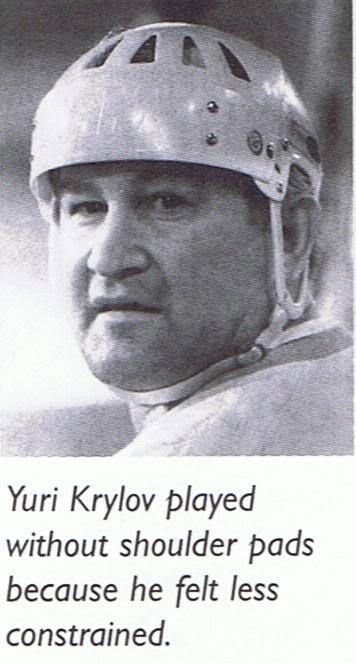 Six minutes and twenty seconds into the middle period, right wing YURI KRYLOV took advantage of a screen to give the Soviets the game’s first goal. With just 37 seconds of the third period played, left wing VALENTIN KUZIN collected his fourth goal at Cortina to put the USSR in front 2-0. The Soviets mustered just nine shots on goal in all, which proved to be sufficent with the play of NIKOLAI PUCHKOV in the USSR nets.